The number of auctions held this week saw a significant decrease, with 1,265 properties taken to market across the combined capital cities, down from 2,578 over the week prior. The decrease in auction activity this week is attributable to the Queen’s Birthday public holiday this Monday, which has affected activity across most states, including Australia’s two largest auction markets. The lower volume is consistent with what is historically seen over this period, with 1,100 auctions reported over the same week last year. Last week saw the final auction clearance rate revise lower to reach 69.8 per cent; an equal second lowest clearance rate for the year so far. The final clearance rate last week was the lowest over 2017 to date in Sydney and Melbourne. This week the preliminary auction clearance rate increased slightly to 71.8 per cent, however it is typical to see clearance rates revise lower as final results are collected. Across Melbourne, this week’s preliminary clearance rate was recorded at 77.1 per cent, up from 73.1 per cent last week and remaining well above the clearance rate for the city one year ago (64.5 per cent). This week, Melbourne was host to 392 auctions, lower than the 1,188 held last week, but higher than a year ago when there were 341 Melbourne auctions held over the week. Of the 9 individual Melbourne sub-regions, this week the strongest performer, in terms of clearance rate was the North West. So far, CoreLogic has collected 29 results for the region and the preliminary result shows 89.7 per cent of these auctions were successful. Sydney’s preliminary clearance rate this week was 71.3 per cent across 457 auction results. There were a total of 610 auctionsheld across the city. Looking back at this weekend last year, 463 auctions were held across Sydney and a clearance rate of 74.1 per cent was recorded. Sydney’s North Sydney and Hornsby hosted the most auctions of any Sydney sub-region this week, with 100 properties taken to auction. The preliminary clearance rate for the region is 75.8 per cent across 66 results. There were 112 Brisbane auctions this week with a preliminary clearance rate of 64.8 per cent, having increased from 42.5 per cent last week across 151 auctions and higher than one year ago when there were 142 auctions with a success rate of 46.3 per cent. The Gold Coast’s preliminary clearance rate was 51.6 per cent across 31 results this week. This week, Adelaide saw a preliminary clearance rate of 73.9 per cent, with 46 reported results across a total of 66 scheduled auctions. 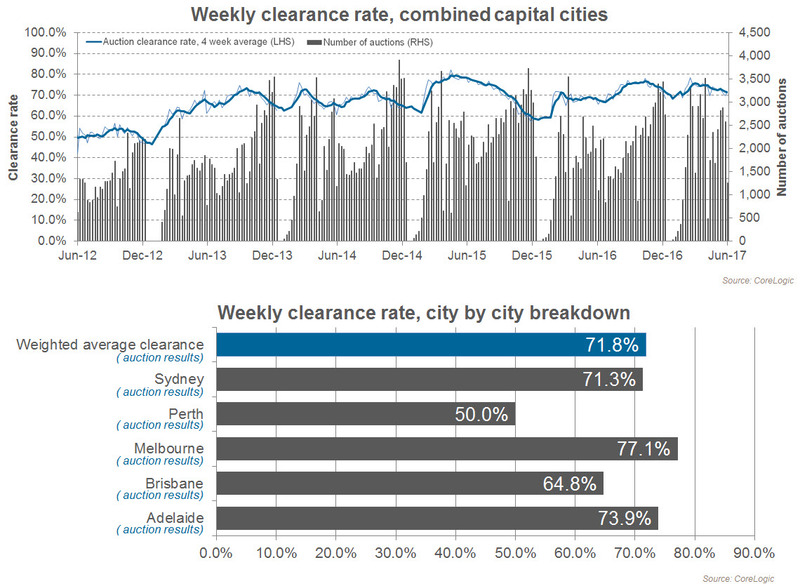 In comparison, over the previous week Adelaide’s clearance rate was 59.3 per cent and 75.4 per cent one year ago. Canberra’s preliminary auction clearance rate of 66.7 per cent this week is lower than last week, when the final auction clearance rate was 68.6 per cent and lower than the 73.9 per cent recorded last year. Tasmania saw 4 auctions take place this week, 3 results have been reported so far, with 2 sales.